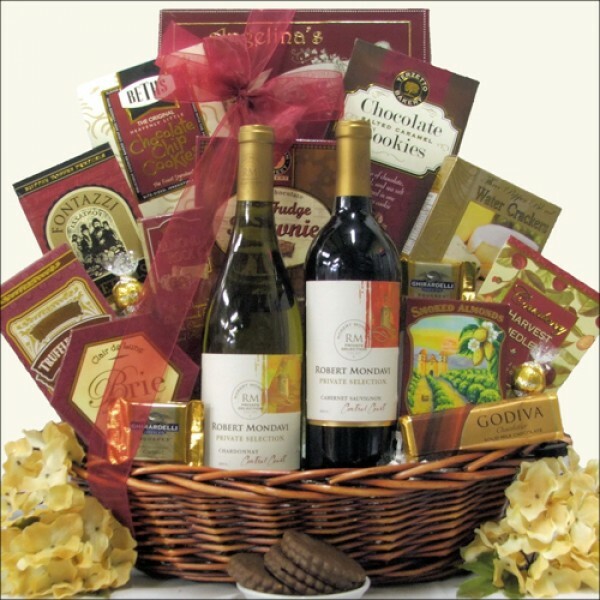 Send them this traditionally elegant wine gift basket filled with two bottles of wine and amazing gourmet foods. 'The Robert Mondavi Private Selection Classic Series Duet' features a bottle of Private Selection Chardonnay White Wine and a bottle of Private Selection Cabernet Sauvignon Red Wine. Also included are an assortment of cheese, crackers, snacks, chocolate, and cookies. A basket that they will enjoy from beginning to end.